If you are like me and like to have a clean and tidy home, but find that there are some aspects to cleaning that you loathe; you might not have the time to spend all day, every day cleaning, nor should you have to. I know there are perfectionists out there who want the picture perfect home and clean all day and every day, but for many this is not practical. Life is often full with work or family life and you should have time to enjoy these activities too. However, if you aim for cleaning activities with short bursts of cleaning power, you can tackle most things in the time allocated. There are some basic tasks that you must do on top of your cleaning tasks, like washing up and doing the laundry. For me I have a list to complete daily which seldom changes. Then I have my cleaning routines, and sometimes I just don’t have vast quantities of time where I am able to clean for hours on end. This is why I like the concept of 10 minute cleaning, I can find just 10 minutes to complete a task and it makes me feel good too. Often if I have spent a long period sitting in front of the computer, it can become difficult to concentrate on the task in hand and I know that it is time for a break. If I can fit in a quick cleaning session in these break times it can boost how I feel, knowing I have a clean home and yet still working hard. What is easy to fit into a 10 minute cleaning session? A quick dusting session: normally I can complete one level of my home in this time. Vacuuming and sweeping session, again on one level of my home. Cleaning a few windows or doors. There are loads of tasks that you can complete in a short space of time, it is not always about deep cleaning; if I am up to date on my quick cleaning I might spend the time on a deep clean of an area, but again I break it down into small 10-minute cleaning tasks. 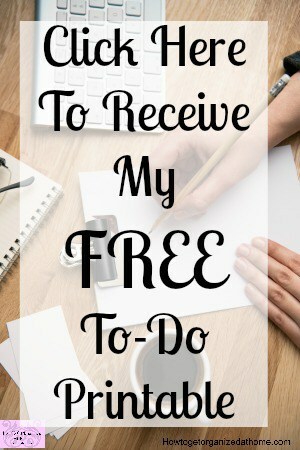 It is important that you learn never to empty out a whole drawer or to clear a complete unit, these tasks often take too long to complete and they can then become tedious. For me the freedom came when I realised that I didn’t need to iron; a pile that never seemed to diminish which haunted me for days. Now I have one less task to complete, folding or hanging up the clothes when they are dry for me is sufficient. Don’t get me wrong, I was a lifelong ironer, I would cringe if someone said they didn’t iron and wonder how they managed. When I stopped, for me it was a freeing experience, like a weight removed from around my neck. 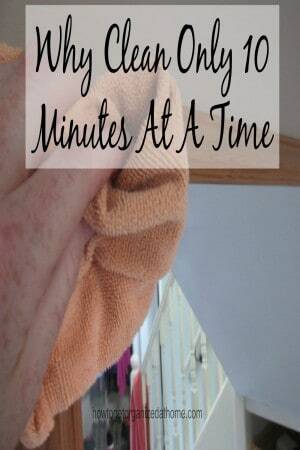 Therefore, using the 10-minute cleaning concept I am able to keep on top of my cleaning schedule without feeling pressured into spending hours or days cleaning.